Fishing boats at low tide on the island of Chiole. The taxi dropped us off at the very southern end of the Pan American highway, the famed Highway 5 that runs from Vancouver, B.C., to Puerto Montt, Chile. The only way to go further south was by ferry. Amy and I had been traveling for 36 hours and we were anxious to check into the hotel, get something to eat, and get some sleep. The three star hotel was an impromptu choice. When my planned lodging turned out to be four times the price we were expecting, the taxi driver had recommended this one. The hotel had two available rooms, so we threw down our bags and walked to a German restaurant that the driver had pointed out not far away. Club Aleman turned out to be one of the more elegant restaurants in town, and we would have felt self conscious being served by the tuxedo clad waiter were it not for the fact that there was only one other couple in the restaurant. Amy ordered a pork chop, which was smoked and quite large. 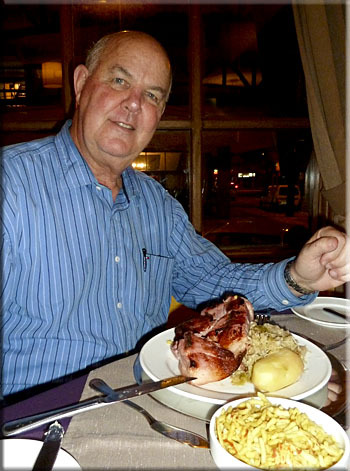 I saw schweinhoaxen on the menu, ham hock, and remembered my walks to the Frankfurt Train Station for this popular German comfort food. It was huge, smoked and delicious. Amy and I shared a dish of spaatzle, and we also shared a local cabernet called 37 Sur (37 South Latitude) that turned out to be our favorite wine of the trip. How we ended up in Chile resulted from a trivial discussion with my Navy friend, Lope. He was musing about how nice it would be to have fresh-picked fruit in the middle of winter. It seemed that Chile provided much of our winter fruit, so I began a search of Google Maps to find the best place in Chile to go for a visit. Several online travelogues expressed that the Lakes District of Chile was their favorite location. It is a region of lakes, volcanoes, the Andes and islands about 600 miles south of Santiago. We decided to go there and play it by ear. Lope's daughter, Amy, was overdue for a vacation and said she wanted to join us. We had a group and a very small bit of plan. In the morning, Amy and I enjoyed the complimentary Continental breakfast, which was standard in most hotels in Chile. We had the morning to kill before Lope arrived on the noon flight, so we explored our small city. 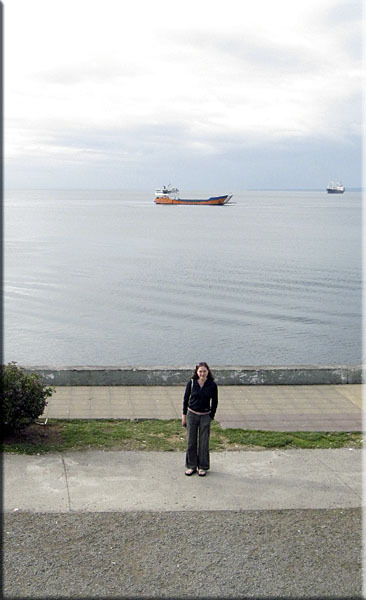 Puerto Montt is the primary port and financial center of Patagonia. It is a city of about 200,000 people and has banks, shopping and commerce to support the communities scattered in the lower 400 miles of Chile. 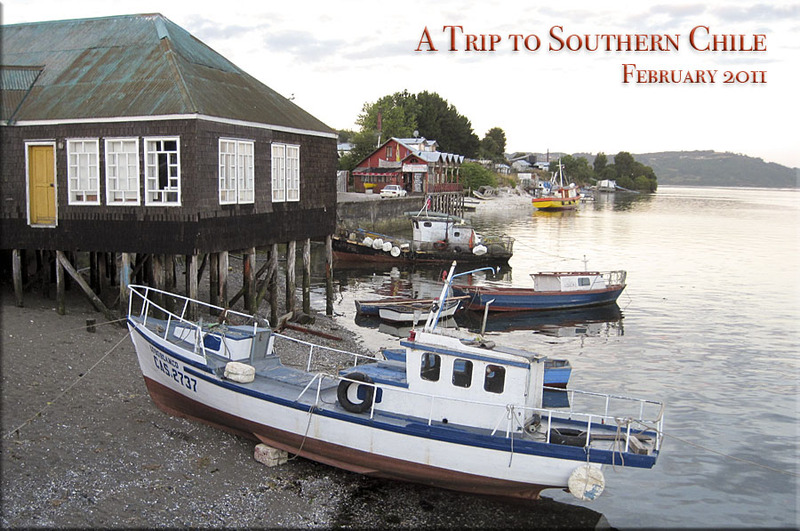 Puerto Montt is the Salmon capital of Chile. The region's fjords and bays are home to the largest salmon industry in the world. Only Norway comes close to producing as much farmed Atlantic Salmon. We walked along the seawall and saw ships waiting to carry seafood to the Americas and to Asia. Cargo ferries moved essential goods to the communities and islands south of Puerto Montt that are only accessible by sea, or air. This city is not dependant on tourists and we attracted little notice. Occasionally someone would recognize our English and talk to us about the city or about their experience in the United States. Never did anyone try to hawk us into buying anything. English in not widely spoken and even some of the hotels had no English speaking staff. Our meager Spanish proved barely up to the task, so it was helpful to be able to ask questions on those occasions when we encountered someone who could speak English. Puerto Montt had a quiet feel to it compared to similar sized towns in Mexico or Asia. 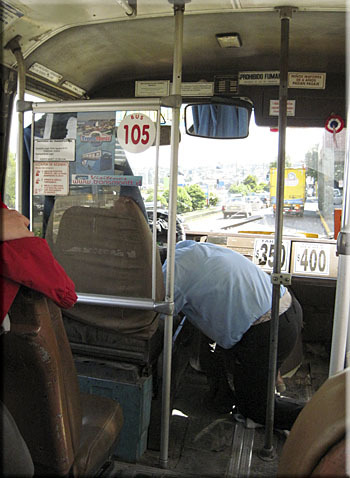 Most people use buses to get around, so traffic was not heavy. The city streets featured mostly two or three storey buildings, and the sidewalks were lined with the usual shops which catered to local needs. February and March are summer holiday in Chile, so we saw families walking the streets, clearly enjoying the treats and shopping available in a "big city," such as Puerto Montt. the northern edge of Chile's inland sea. Schweinhoaxen and spaatzle at Club Aleman in Puerto Montt. In the 1860s, Germany sent emigrants to settle in Puerto Montt, and the surrounding region still shows much of that influence. "Bigger" is the supermarket chain of Chile. 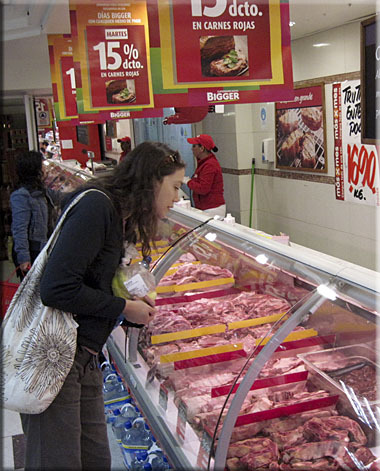 Here Amy examines their ample meat selection. German cuts and sausages are common. 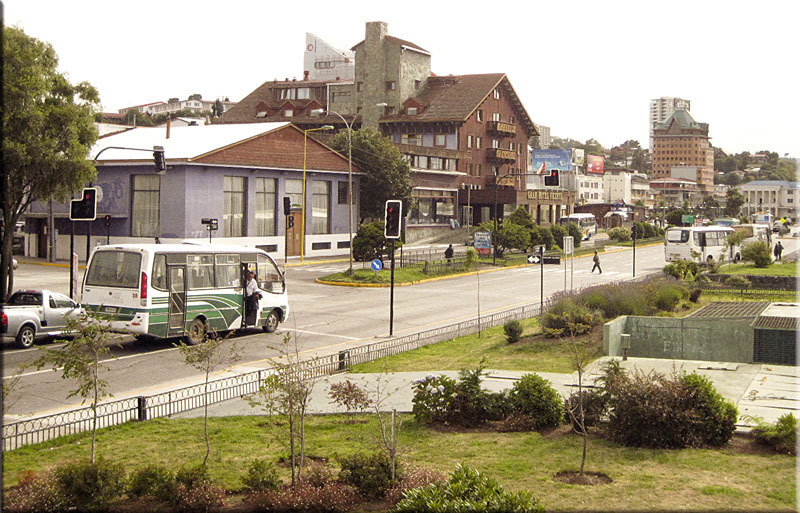 Harbor front avenue, Puerto Montt. 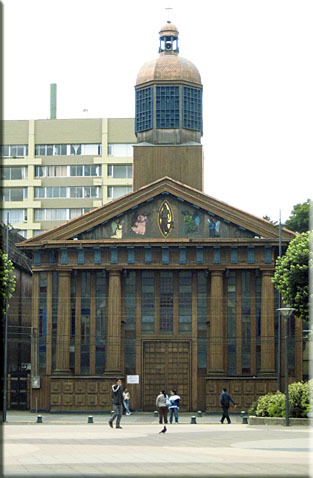 The Catholic cathedral in Puerto Montt. We never waited more than five minutes for a local bus. Here the driver makes a quick repair. 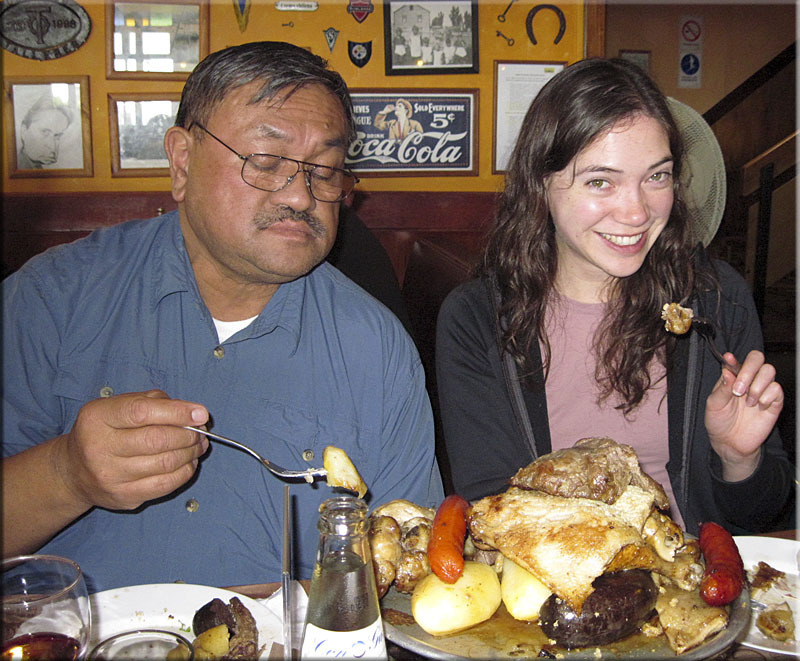 If it seems like we ate copious amounts of meat in Puerto Montt, you are right. Here is the Chilean favorite, Parrillada. It is a heaping platter of many cuts of beef, pork chicken, sausage, blood sausage, tripe and stuffed intestine. The meat is grilled with a savory rub. We couldn't possibly finish it, but we tried. Cost for the platter, $22 dollars. A good Chilean red wine, another $7. Lope has the jet lagged look of someone who just traveled 30 hours.